Tim Sprankle, pastor of the Grace Brethren Church, Leesburg, Ind., is part of the team charged with encouraging leadership development within the Fellowship of Grace Brethren Churches. He recently shared how leadership could inspire a ministry with an example from his own experience. The ESL class at Leesburg Grace Brethren always ends the school year with a party. We break the English-only rule for the day, calling the event a fiesta. We also break a piñata. After three years, our ESL ministry has gained traction. The team of teachers and childcare workers love their students. They’ve spent countless Tuesdays together, taking breaks only when public school is out of session. To bring attention to how God has used them, I took a moment during the Sunday morning worship service to brag on the team of eight volunteers. I mentioned their faithfulness and deep reach into the lives of an overlooked group of women. Hispanic mothers often are the last ones to learn English in their homes. Their five-year old children interpret for them in check-out lines and school meetings. After requesting applause for the ESL ministry team, I took encouragement to a new level. I shared about the fiesta and made a comment about the ministry team leader. “I wish you could have seen Diana Davis whack the piñata. She’s a force to be reckoned with.” When the laughter died down, I realized I had captured footage of Diana’s piñata rampage. I promised to upload it to YouTube and share the link. The next day I followed through with my promise. In my weekly email to the church I embedded the video of the piñata massacre: bats swinging; people jeering; children swarming; candy spilling like guts all over the floor. And it only took a couple of clicks from my smart phone to share the experience with the entire church. A word of appreciation or pat on the back may inspire ministry. Applause on a Sunday morning is a nice touch. But in the technological age, we can take celebration farther and faster. Shared images on Instagram, photo mash-ups on Animoto, and broadcast videos on YouTube are but a few ways to go beyond a word of appreciation to an image that inspires. 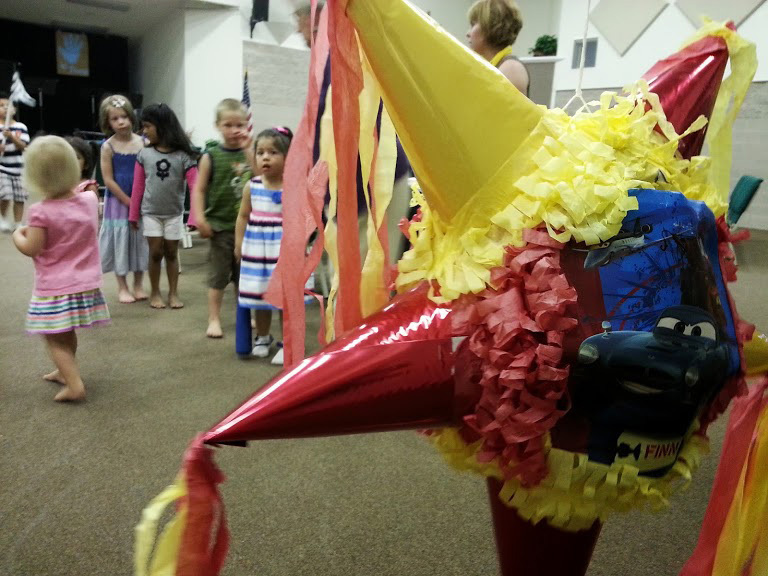 And nothing inspires others in ministry like a seventy-year old woman terrorizing a piñata. How do you inspire ministry? Share your story in the comments below.